Fernando Alonso is a two-time world champion with a raft of statistics to back up claims from fans and pundits alike that he is one of the most talented drivers ever to race in Formula 1. 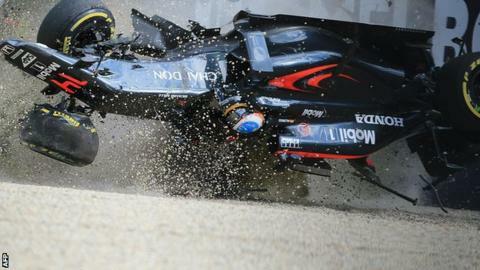 But it's been a rough couple of years for the 34-year-old Spaniard, whose return to McLaren has not gone as planned. After a difficult 2015, Alonso now misses the Bahrain Grand Prix - and perhaps further races - with chest injuries sustained in his terrifying 180mph crash in the first race of the season in Australia. Here, BBC Sport's chief F1 writer Andrew Benson assesses his career so far. The raw statistics are impressive enough - sixth in the all-time winners' list, second in total points, third-highest number of podiums in history. But the most impressive thing about Alonso is that he has achieved those feats despite hardly ever having the fastest car. At 34 and coming up for three years since his last win, he remains the drivers' driver. He may not be quite the fastest on one lap, but he is arguably the best and most complete on the grid. Remorseless and relentless, Alonso is one of the very few who can get the best out of whatever car he is given to drive, in whatever circumstances. He arguably gets closer to the limit more often than anyone else. Alonso may have won just two world titles, but, over his career, is eight points short of being a five-time champion, after narrowly missing out in 2007, 2010 and 2012. He can blame himself for one of those near-misses - he had a meltdown at McLaren alongside Lewis Hamilton in 2007 - but the other two were definitely not his fault. And four titles would be about what he deserves. In 2012, he put together one of the greatest seasons by any driver ever. Some of his victories - in Malaysia in a car that could not qualify in the top 10 at the previous race - would not have been achieved by another driver. Some of his overtaking moves defy belief. Memories and achievements like that are indelible, no matter how his career ultimately comes to an end. Angry at McLaren for allowing for rookie team-mate Lewis Hamilton to compete with him, Alonso blocked the young Briton in the pits at the 2007 Hungarian Grand Prix. Alonso's relationship with the team broke down soon after and he headed back to Renault after just one season. Alonso managed to drag an unspectacular car to two wins in 2008, but the Singapore GP victory would ultimately be tarnished when it was revealed that Renault had instructed team-mate Nelson Piquet Jnr to deliberately crash to bring out a safety car to the Spaniard's advantage. But a glittering period at Ferrari beckoned. After making his F1 debut in 2001, Alonso did not race in 2002 before his debut victory for Renault in 2003 at the Hungarian GP. His last victory was at the 2013 Spanish GP - 53 races ago. Things started positively enough at Ferrari, with five race wins in 2010. But he did nothing for team relations once again when, at the German GP, Ferrari race engineer Rob Smedley told Felipe Massa over the team radio: "Fernando is faster than you." Massa responded by letting Alonso through moments later, but many people were outraged at the apparent team orders. Victory at the Korean Grand Prix (pictured) in October 2010 meant Alonso led the world championship by 11 points from Mark Webber with two races left. Surely a third title was his for the taking? It wasn't to be as Alonso spent most of the season-ending race in Abu Dhabi stuck behind Renault's Vitaly Petrov as Sebastian Vettel, Webber's team-mate, came from third place to break Alonso's record as the youngest world champion. Believing he would never win the world title again if he stayed at Ferrari, Alonso stunned F1 by returning to McLaren for the 2015 season, just as the team took on woefully unreliable Honda engines. During the Japanese GP, Alonso vented his frustration by describing the car's performance as "embarrassing" over the team radio. It got worse. After his McLaren broke down during practice for the Brazilian Grand Prix, Alonso sunned himself and joked that next time he would take his phone and sun lotion out on to the track to make the most of any future sunbathing opportunities.